Just two more shopping days left!If you happen to find yourself looking for last-minute gifts at Sephora, check out Lavanila Laboratories healthy fragrances. Lavanila fragrances ($58) are all based around a vanilla scent. The collection includes Pure Vanilla, Vanilla Passion Fruit, Vanilla Lavender, Vanilla Coconut, my favorite Vanilla Grapefruit, and the newly launched holiday fragrance - Blackberry Vanilla. Lavanila's scents contain natural ingredients like essential oils, 100% natural botanical extracts, spring water and organic cane alcohol, and are free of drying alcohol, petrochemicals and phthalates. The scents are healthy and sweet-smelling, yet not overpowering. Some of the natural ingredients include Goji Berries, Kakadu Plum, Olive Leaf Extract and Canadian Willowherb. 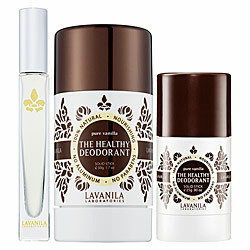 Lavanila's rollerball ($19) and mini deodorant ($10) make great stocking stuffers. I love to keep both the rollerball and mini deodorant at the office, but they are are also great for travel or to throw in your gym bag or purse. My skin is sensitive to deodorants, and I'm glad I finally found one I like that has odor protection and doesn't irritate my skin, or have harsh chemicals. The Healthy Deodorant is free of Aluminum, Parabens, Propylene Glycol, Talc, Phthalates and Triclosan. It is formulated with health-promoting beta-glucan technology packed with anti-oxidants, active botanicals and essential oils. If you are thinking of gifting several of Lavila products, check out the gift sets. Lavanila Laboratories is available at Sephora, sephora.com and lavanila.com.